The #CuticleOnly nail art trend arrived on the scene in 2017, but shows no signs of disappearing anytime soon. For those who love French tips but worry that this look is too complicated to master, think again. 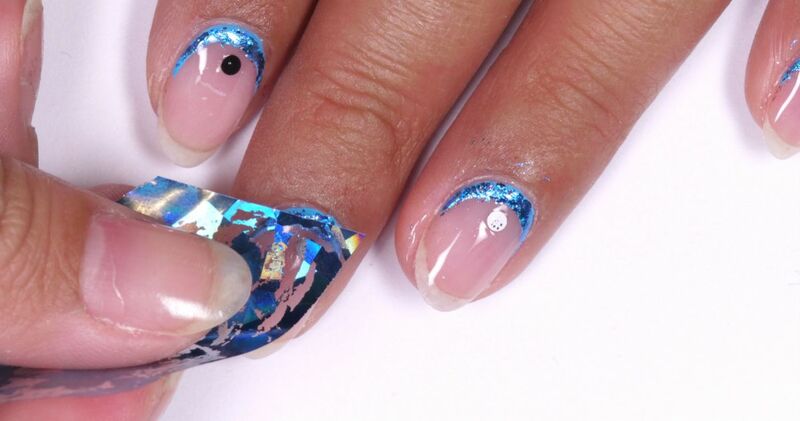 Decorating the cuticle area means concentrating on a shape that's already present. Think of it like drawing inside the lines — the cuticle line, that is. This glitzy design features three different shades of blue, including nail paint, metallic transfer foil, and a deep blue sequin. To pull off this look, keep the base of the nails natural by applying a single coat of clear nail gel. Nothing should distract from the colorful action taking place at the base. Ready to give it a go? The following tutorial video breaks down the steps one by one, making the whole process straightforward. 1. Before decorating the cuticle area, apply one layer of clear gel base coat polish to each nail and cure with the UV or LED lamp (step not shown). 2. Paint a half moon near the cuticle of each nail with blue gel nail paint and a fine-tipped nail art brush. Bring the paint halfway up the side of the nail to mimic the look of a reverse French tip, then cure the nail with the lamp. 3. Apply a layer of clear gel base coat over the blue paint and cure it. 4. Press metallic foil against the blue portion of each nail. Tip: Remove any stray foil that adheres to the nail or the skin with a cotton swab, then cure the nail with the lamp. 5. Apply a small amount of clear gel base coat polish to the design and just beyond it and cure. 6. Place a metallic sequin just in front of each half-moon design with the dotting tool. 7. Seal the design with a layer of clear gel top coat and cure.